The Dot, Hollow Body/Semi Hollow Body Electric Guitar from Epiphone in the Dot series. I've only been playing guitar for a bout 5 years now. I got into it after seeing Green Day live. I'm in a band now, and we do some punk copies, but also write our own stuff. I actually found this guitar on ebay. It was used and a few years old, but I only paid $280 or something close to that. Can't remember exactly. I've always been looking for a semi-hollow to add to my collection and I've always been a fan of the look of these Epi's and I've always heard they have some cool tones. I like the sustain I get from the semi-hollow body. The three way switching is a nice feature and basically lets you go from the front humbuckers, to both mixed, to the back humbucker so you get sort of a chorusy mellow tone from the front and a nice lead type cutting tone from the back. I like the look of the guitar and the neck is real comfortable to play. It's nice and wide and helps me finger chords a lot more easily because of my fat fingers. I've been having a little bit of a challenge keeping the G (3rd) string in tune. I don't know if it's the nut or the bridge, but it seems to go sharp a lot. I don't know if this is a problem with all of these guitars or just this one, or if it's something that I did to it, but just wanted to throw that out there for you to chew on. It's probably nothing, and I should probably just take it to a guitar store to have it checked out. 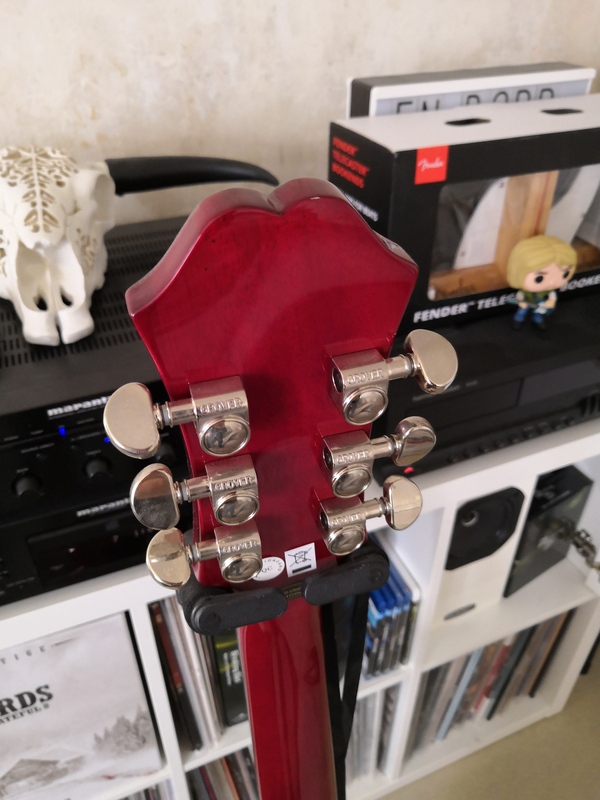 I also don't like how the cord jack is on the face of the guitar, although I'm guessing they're all like this by design. I've pulled the cord out a few times accidentally. Construction is decent. It's an Epi so it has a nice balance of cost versus quality. The fit and finish are pretty good and probably only a trained eye could tell the difference between one of these models made overseas and ones produced here in the U.S. Overall, for the price I paid, I think it's a really sweet 6 string. It's not the best quality, not the worst, and it does have a few issues that bug me, but overall not bad. I would recommend it to anyone looking for a backup axe or a semi-hollowbody that they need for a specific purpose, song, or recording project. Nice fit and finish; classic looks for the price. Very nice guitar for the money. A bargain relative to a comparable Gibson es-333 or es-335. Probably lacks tone for anyone other than a novice. I paid $450 at Old Boise Guitar. 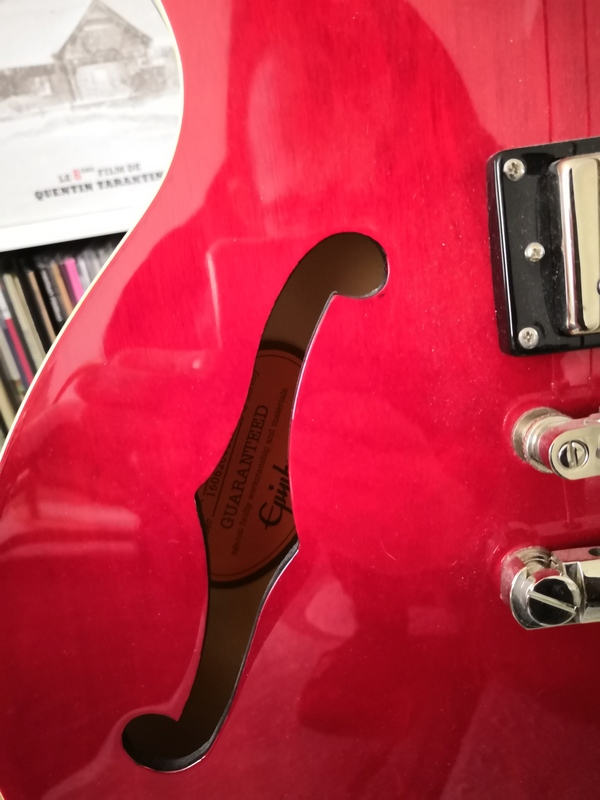 MGR/Brendan Lorimer's review"Epiphone ES-335 Dot"
I bought this guitar from a music store in North Bay, Ontario and the price was originally $599.99 but I found it considerably cheaper at Steve's Music Store (that's the place to go! )at $439.99!!! So I price matched at the North Bay store and with taxes and everything it came to $516.00, which was exactly what I was willing to pay.And the reason I bought this is because guitars are my life and my passion. Where do I begin? 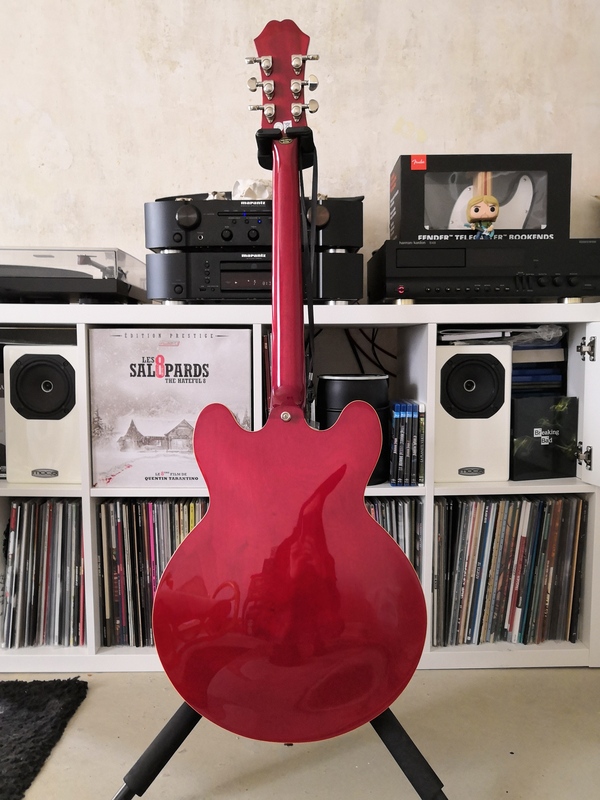 First,this guitar is absolutely beautiful, a sweet cherry red colour with curves like a woman. Also, it's f-holes give a great sound and look amazing too. It's humbuckers are very powerful and can go from crystal clear to dripping in distrortion with no problem. I heard that it would be to heavy but it was no problem , considering I'm as skinny as Jimmy Page.Also the action was very comfortable. 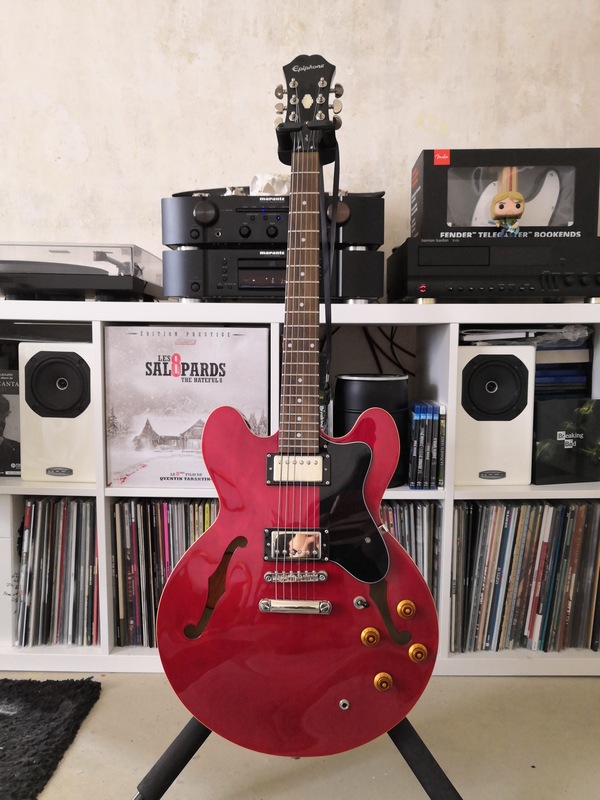 The ES-335 is very solidly made with all details paid attention too, so other than that, all I can say is that the Korean's really know their guitars. 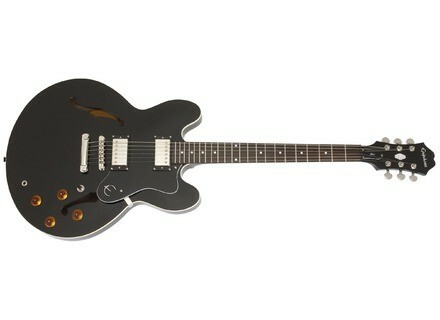 All in all, I was exceptionally pleased with ES-335 and this is a prime example of more for your money. I treat this thing like my best friend and I can't wait to wail on this guitar when I play this at a battle of the bands I'm playing next week! Peace out and Jimmy Page is god!